After: New screen protects fish. After: large woody debris to enhance habitat. The Byerley Screen Project was a complex and challenging undertaking that required a considerable amount of planning. 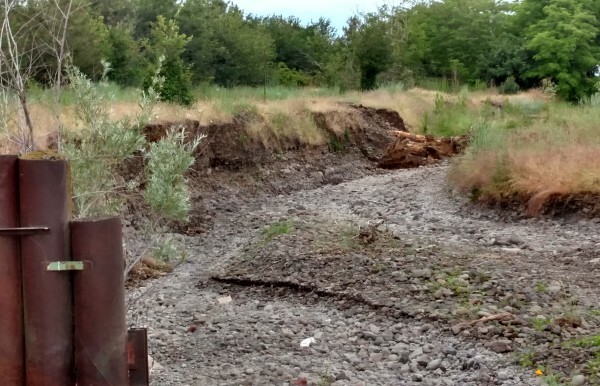 The project site is located along Cottonwood Creek, which is an intermittent waterway. 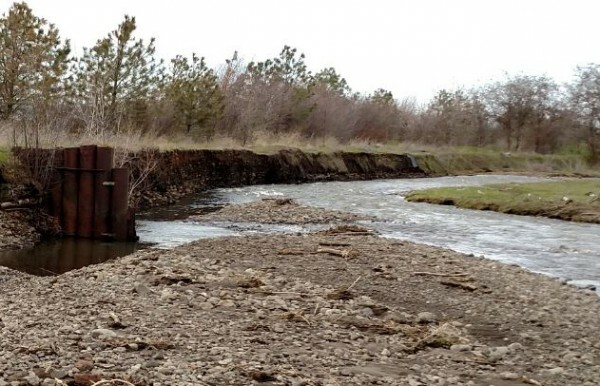 The irrigation intake led to an irrigation pipe and canal and emptied flow into a pond off the creek. Adult fish were being kept out of the system by a debris screen, but juvenile salmonids could (and did) pass through. When the creek ran dry in the summer months, salmonids would be stranded. District staff had pondered how to resolve the site challenges for several years. A design was drafted and funding obtained. Then high flows altered the gravel bars in the stream and the original design became obsolete. It took some innovative ideas to resolve the site concerns. 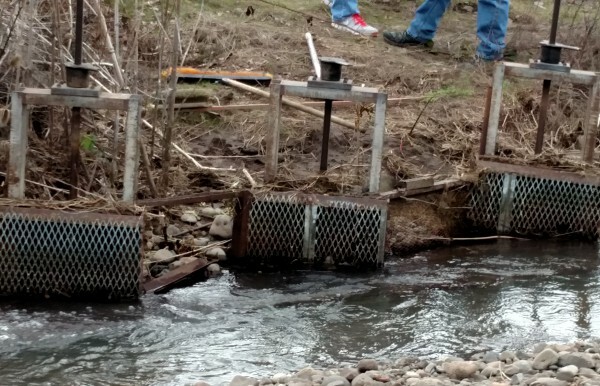 WDFW Yakima screen shop refurbished a fish screen to meet engineering specifications and National Marines Fisheries Service requirements. The project also included enhancement of the channel with large woody debris to mitigate for screen construction and to protect the fish bypass. 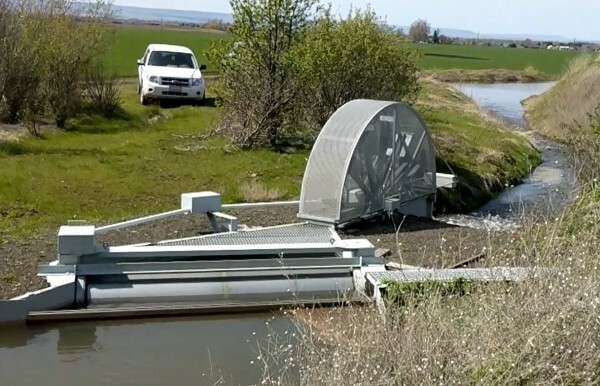 Prior to construction, 191 salmonids and over 300 fresh water fish were removed from the pond and canal, highlighting the need for an effective fish screen. The new rotating drum screen is much more efficient than the old grate system and completely screens the intake. Thanks to the new screen, juvenile fish are no longer at risk for stranding in the irrigation pond. Shortly after project completion, a significant rain event gave staff a chance to observe the screen functioning perfectly. 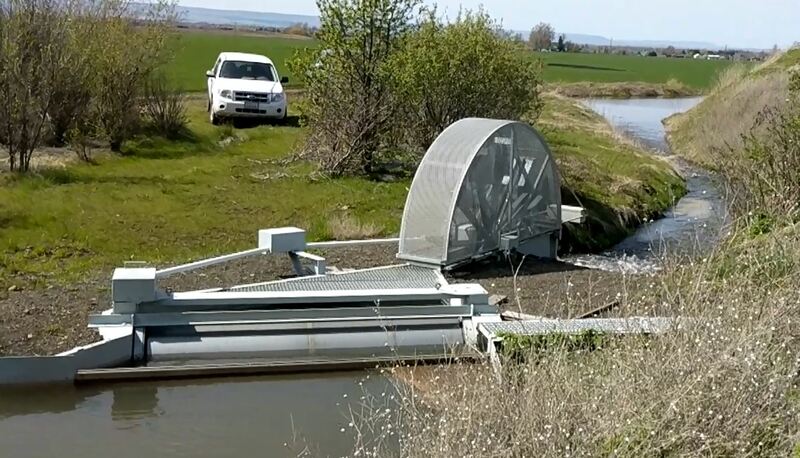 The project is a good example of collaborative efforts from the landowner, the Walla Walla County Conservation District, and Washington Department of Fish & Wildlife. 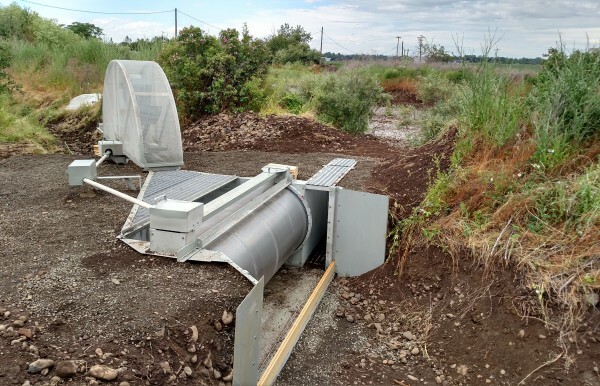 It shows that endangered fish species can be protected while irrigation continues on working lands, thanks to voluntary landowner projects, innovative thinking, and support from partner agencies. For more details, read the Final Report – Byerley screen.